Whipps Cross Strikers need our support! 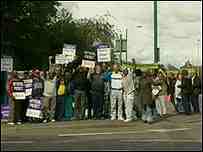 I was very happy to join striking workers on the picket line outside Whipps Cross Hospital this morning. The BBC website explains what their dispute is about. 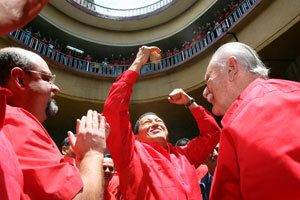 I was greatly encouraged by the strength and determination of the strikers. The media have reported that the employers have made an offer to settle the strike – but may have forgotten to mention that this is not an offer to pay all the money the strikers are owed! I have blogged before about this important dispute, in which low paid workers are fighting to ensure that a private contractor honours a deal done with a previous contractor. It is important for all workers that the strikers win, so that privateers cannot make their profits at the expense of cutting the pay and conditions of the workforce. Those who support the Tory/New Labour policy of privatisation need to know that they support the making of profits out of the exploitation of low paid workers. The Whipps Cross strikers and their UNISON branch are in the front line of opposition to those who want our health service to be driven by profit. If you are reading this then you ought to support this dispute. Send messages of support to the strikers’ union branch at unisonunion@tiscali.co.uk. Send donations (cheques payable to UNISON) to Chris Remington, Regional Head of Health, UNISON Greater London Region, Congress House, Great Russell Street. London WC1. 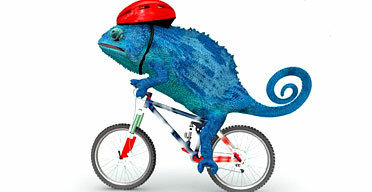 I’ve just posted a couple of international stories in quick succession, both dealing with problems affecting the trade union movement (from Australia to Zimbabwe). I thought therefore I should post a link to the campaign in solidarity with the people of Venezuela, who offer hope to us all. UNISON policy is to support the colossal advances being made by the Venezuelan Revolution under President Hugo Chavez in carrying out policies, which benefit working people, the poor and the landless. That sounds good to me! In looking for solidarity websites I found Hands Off Venezuela, the Venezuela Solidarity Campaign and the Venezuela Information Centre. Let’s hope we can all unite in a good cause comrades – and let’s not forget to fight for socialism in the UK too! This news comes from the International Confederation of Free Trade Unions (ICFTU), courtesy of a comrade on the Regional International Committee of UNISON, kept informed by UNISON’s International Department. Wellington Chibebe, General Secretary of the Zimbabwe Congress of Trade Unions (ZCTU) was recently released on bail. Unfortunately, the charges against him have not been dropped, and he is due to appear in court on 4 September. M. Chibebe was arrested at a roadblock on August 15 and detained at Waterfalls Police station. The police demanded to search his car, supposedly in order to look for cash. The Government is currently campaigning to prevent currency speculation while it is conducting a major monetary reform purportedly aiming at fighting hyperinflation, which currently stands at over 1000%. At first, Chibebe was accused of resisting a police search. According to ZCTU legal sources, however, the police later deliberately changed the charges to common assault against a police officer so as to make the issue more serious, given his profile. The ZCTU are now calling for a national strike to protest the government's skewed economic policies, specifically a sharp hike in fuel prices last week that they say has made it too expensive for most workers to travel to their jobs. This news is just in from LabourStart. 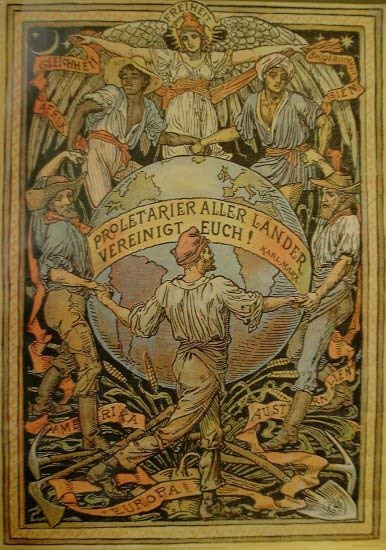 world, breaking new ground in its efforts to smash the trade union movement in that country. Among its first victims are 107 construction workers, who are being prosecuted for alleged "illegal" industrial action following the sacking of a union delegate. According to Kevin Reynolds, Secretary of the West Australian Branch of the CFMEU union, "Under the Howard Government, the basic right to vote to take strike action in support of better conditions and a safe workplace has now been criminalised." The workers made their first appearance in court yesterday (Monday). They are asking workers around the world to mobilize and send messages of protest to government officials today. Click this link to go to LabourStart and show your solidarity. Today’s Guardian boasts a column by one Peter Wilby, former editor of the New Statesman, in which he predicts that the Tories will win the next General Election and says he thinks that that is a good thing! Regular readers of this blog (all four of you…) will know that I am no fan of New Labour and want to see real change in the Labour Party – to the extent of supporting a socialist challenge for the Labour leadership. However, to welcome the prospect of a Tory victory is daft beyond words. If you are in any doubt check out the policies of a Party committed to cutting hundreds of thousands of public sector jobs and eliminating regulations that protect workers rights. I don’t suppose Peter Wilby is a low paid worker who will suffer even worse under the Tories than under New Labour. Someone who only aspires to commentate upon events can have the luxury of sitting back and watching as things get worse (particularly if they can sit back on the cushion of relative wealth and comfort). Working people cannot afford a Tory Government - which is why we need to replace New Labour with a Labour Government. Peter can dismiss John McDonnell as a no hope candidate, but a candidate broadly sharing his politics got more than 50% of the votes in the recent elections to Labour's NEC. And whilst John may be older than Blair the crucial difference is that he is promoting new and exciting politics, whereas "New" Labour is so far past its sell by date it is smelling very bad now. However, with the opinion polls suggesting that we could see another Tory Government, it is increasingly urgent that the unions and the Labour Party membership act to reclaim the Party from New Labour. 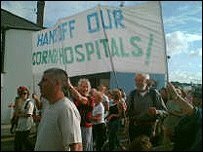 When there are thousands marching in Cornwall I think it is time to wake up to the fact that the threat to our NHS is nationwide. UNISON members at NHS logistics are fighting privatisation. I’ve blogged before about other campaigns. In particular I look forward to joining the picket line at Whipps Cross Hospital on Wednesday 30 August. What are nice trade unionists like us doing in a Labour Party like this? The friendly folk at the Socialist Unity website asked me for my views. So I explained why I think socialists should be active in the Labour Party. I believe this because there is a viable socialist organisation within the Labour Party and because the Labour left has found a standard bearer willing to challenge for leadership of the Party – which means that we can try to force socialist ideas onto the Party’s agenda. The recent results of the elections to the Party’s National Executive give some grounds for optimism. I know that many good trade unionists have given up on the Party and have other ideas about how to organise politically, whether in coalitions or new parties. I sympathise with and respect these comrades but disagree. 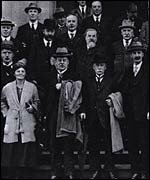 It is 100 years since the Party created by the trade unions became a serious force. We need a political voice more than ever if we are going to fight for trade union rights or against privatisation. I really don’t see why we should abandon the Party we created and go away and try to build a new one – when the majority of Party members who voted in the last elections to the National Executive backed left wing candidates. Is the TUC General Council meeting the challenges it faces? “Despite the efforts of unions and some genuine improvements in employment legislation over the past nine years, not least the introduction and uprating of the minimum wage, too many workers in Britain today are vulnerable to exploitation by rogue employers. Many are migrant workers, new to this country with little knowledge of their rights. Many are young - often students trying to work their way through college. A considerable number are employed by agencies with more limited legal rights than those on permanent contracts who often work alongside them. These are laudable sentiments – and the trade union movement certainly needs to reach out and organise the unorganised. I worry that the top of the trade union movement is a bit complacent about the current state of our movement. The recently published report of the findings from the 2004 Workplace Employee Relations Survey shows that only a third of workers are in trade unions and that almost two-thirds of workplaces (64 per cent) had no union members, and that union members made up a majority of the workforce in only one-sixth (18 per cent) of all workplaces. In 1998, 57 per cent of workplaces had no union members and union members made up the majority of the workforce in 22 per cent of workplaces. Compared to the 1998 survey overall union density (the proportion of workers who are union members) has fallen, slightly, from 36% to 34% during the period of (New) Labour Government. These figures aren’t necessarily accurate – other recent research suggests current union density could be as low as 29% (in 2005) – although that research suggests an increase of 0.2% from 2004. What is clear is that we have not experienced the sort of recovery in union membership we were hoping for over recent years. So the TUC does need to reach out to vulnerable workers. I read somewhere that it would help if the TUC would back an amnesty for undocumented migrant workers. Anyone reading this who is not already a trade union member should join. UNISON members should sign up to recruit new members as part of the Union’s Challenge X campaign. Good news from the UNISON website. The NHS has been told to ditch plans to hand a Derbyshire GP practice over to a US multinational firm – thanks to a pioneering legal fight by pensioner Pam Smith.The Court of Appeal quashed the selection of United Health Europe – the British arm of the biggest US healthcare corporation – to run the practice, and ordered North Eastern Derbyshire primary care trust to start the tendering process from scratch. This is a good result for the Keep Our NHS Public campaign and for UNISON’s campaign to keep our NHS working. I was very pleased to attend yesterday’s event, organised by the Greater London UNISON Regional Black Members Committee as part of the Remembrance Day for Slavery. This event was held to implement and support UNISON’s policy, which is that there should be a national day to commemorate the transatlantic slave trade and its abolition, just as there (rightly) is to commemorate the Holocaust. It was good to be reminded of the work of CLR James on the slave revolt in Haiti in the 1790s, and also to hear from today’s campaigners against slavery. The wealth of Europe and North America in particular was built on the slavery and oppression of African people kidnapped from their homes and subject to the most appalling treatment. This is not simply a piece of history, because its consequences are all around us. When slave owning was abolished in the 1830s, compensation was paid to the owners. Nothing was given to the former slaves to compensate them. Next year it will be 200 years since the abolition of the slave trade in Britain, so now is a good time to find out more as well as to support the campaign. 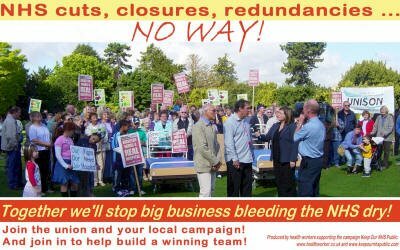 Support the Whipps Cross Strikers! Low paid privatised workers at Whipps Cross Hospital in East London are taking further strike action for three days from next Wednesday (30 August). The strike concerns the refusal of Initial (the current contractor) to honour an agreement on harmonisation reached with ISS Mediclean (the former contractor) following strike action in 2003. The strikers have already taken several days of action, and the picket lines have been well supported by 220 strikers out of 242 balloted! For those who are near enough to London, please support the picket lines at Whipps Cross Hospital in Leytonstone from 6am to 6pm on each day (Wednesday to Friday). A number of London branches will try to get there with their banners at 8.30am on Wednesday, but the strikers can use our support at any time. Wherever you are in the world you can also support the dispute by sending donations (cheques payable to UNISON) to UNISON Greater London Regional Office, First Floor, Congress House, Great Russell Street, London WC1B 3LS. Please be sure to indicate that this is a donation for the strikers in the Waltham Forest Health Branch! Cash donations can, of course, be handed over on the picket line! The final agenda for this year’s TUC Congress has been published and is available to download at the TUC website. The process of “grouping” or compositing motions will mean that there will be considerable further change before Congress opens in three weeks time. The main media interest in Congress has been about the likely reception for Tony Blair. Certainly the motions put down by UNISON for this year’s Congress are rightly and sharply critical of Government policy. As avid readers of this blog (all three of you ;) ) will know, I was keen to see the sensible proposal for an “amnesty” for so-called “illegal” migrants get discussed, but was knocked back at the UNISON delegation meeting on the grounds (essentially) that there was not yet a sufficient consensus for this demand (although it is supported by both UNISON and the TGWU) and that as TUC policy was “inching forward” in our direction it was better not to push the issue at this year’s Congress. Whilst it is pleasing to see that the level of union interest in organising migrant workers is such that the worthy motion from the Educational Institute of Scotland has drawn helpful and supportive amendments from USDAW, UCATT, UCU and the Bakers’ Union, I think it is a shame the union movement is moving so slowly towards support for sustainable regularisation of the position of undocumented workers. Without this, attempts to organise migrant workers whose legal position is insecure can easily be undermined by the unscrupulous employers who are exploiting migrant workers. Thanks to the Government’s underestimate of inward migration from Eastern Europe, the debate about migration is being run from the political right at the moment (as I suppose it almost always is) – and the chances of shifting this New Labour shower in the sensible direction of an amnesty is slim enough between now and the next General Election. I hope that the TUC doesn't "inch" towards our position so slowly that we lose the opportunity to free thousands of migrant workers from the fear of deportation. As Blair staggers through the final months of his tenure as Prime Minister there is no let up in the push to privatise our health service. Yesterday’s Guardian reports on plans for six new hospitals built using the Private Finance Initiative (PFI) whilst other hospitals face closure (including Central Middlesex hospital shown above). Mike Jackson, senior national officer for Unison, is quoted in the Guardian as follows: "Using PFI to finance these schemes is a waste of taxpayers' money. PFI schemes are expensive, inflexible and adding to the current financial burdens of many hospital trusts." We also know that there is no public support for further privatisation, based on recent opinion poll evidence. 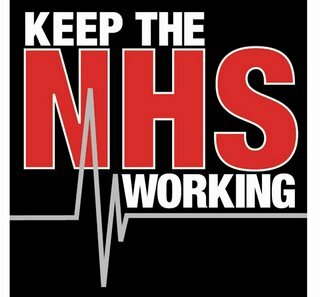 UNISON members are preparing for action to defend our NHS from Cornwall to South London and for a strike against the privatisation of NHS logistics. Why should UNISON members have to be doing this under what is supposed to be a Labour Government? Meanwhile Stephen Byers (who is famously not too keen on the unions’ relationship with the Party) thinks the Government’s priority should be to end inheritance tax! This lack of focus by one of Blair’s chief outriders on the real issues confronting the country shows just how out of touch the Blairites now are. Unfortunately they are still calling the shots in Government. 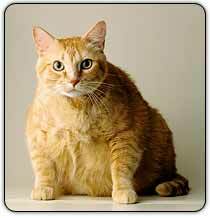 We are not the fat cats! Gordon Brown (the person some of our union leaders dream of “influencing”) wants to force the supposedly independent pay review bodies to hold public sector pay rises down to 2% according to the Guardian. This is the day after it was reported that bonuses paid out in the City now total £19 billion! While trying to hold down public sector pay, the Government want to see increased pension contributions even from those whose pension rights are being protected – like health workers and teachers. At the same time, the Association of British Insurers have written to directors of our largest private companies to complain about over generous pension pay outs for company directors. This is the sort of thing which makes me think we need a socialist candidate for leader of the Labour Party, who can be relied upon to promote the interests of trade unionists before those of the overpaid city fat cats – John McDonnell springs to mind! Keep up the fight for local government pensions! Delegates had a lot of questions and expressed a good deal of concern and dissatisfaction from members over the loss of momentum on protection of retirement at 60. When the top table tried to cut this off in order to split us up into workshops to discuss 'why is protection important?' there was, basically, a rebellion - we refused. They were forced to re-jig the agenda to give more time for debate and feedback and more discussion of how to revive the campaign for full protection. Apparently this will re-shape the remaining Regional briefings, and I suspect there'll be some feedback to Mabledon Place about stroppy Yorkshire folk too.. Don't know if they'll want to come up here again! 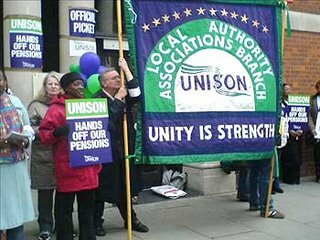 UNISON members in the Greater London Region will be meeting tomorrow for the Regional Pensions Briefing. I’ll miss this as I will be on the beach. It does seem to me that as well as asking why we should accept any of the Government’s options for the future of our pension scheme, we do need to ensure that we are continuing to fight for the full protection which a million workers struck for on 28 March. I look forward to hearing how the event tomorrow goes! I was pleased to read the news that members of the Prison Officers’ Association (POA) have voted to strike – in spite of the refusal of the New Labour Government to restore their right to strike, which was removed by the Tories. I read this this morning in the Morning Star. With only a handful of votes left to be counted, nearly 15,000 members have backed action and 2,400 voted against. The union has described the dispute as being over the independence of the pay review body and claims its members have seen a pay cut. According to the BBC, the Prison Service said it was a matter of grave concern that the POA might act in breach of a legally-binding accord. I think it is a matter of grave concern that our Labour Government hasn’t fully restored the democratic rights of trade unionists which were taken from them – and which Labour was pledged to restore when in opposition. The threat of legal action against the POA if they carry out the wishes of their members is a good indication of why we need the Trade Union Freedom Bill, in line with UNISON policy. I hope UNISON, and other unions, will show solidarity with the POA. Will they still need us when we're 64? The Beatles’ wondered whether we would still be needed when we were 64. A TUC report today reveals that over one million 50 - 65 year olds who want to work can't get a job because employers won't recruit older workers or retain the ones they already employ by investing in training or making minor adjustments for disabilities. For those of us who are approaching that age (which is all of us) these are worrying findings. On the one hand the Government want us to work further into old age – on the other hand, the employers won’t actually employ those who aren’t in the first flush of youth! This is in spite of some fairly sensible advice from the Government being available on the web. Those of us who are negotiating regularly about redundancies (which is far too many of us in the unions I fear!) need to be on the ball about defending the rights of our older members, and ensuring employment opportunities for the over 50s. Campaign for the Trade Union Freedom bill. The RMT has called a National Shop Stewards conference on Saturday 28th October, 12 - 3pm, at the Camden Centre in London. The main discussion will be on the campaign for the Trade Union Freedom billThe conference will be open to delegates from Trade Union branches, trade union councils, and joint union committees. This follows on from the conference on working class representation organised by the RMT last January, where Bob Crow spoke about the need to build a shop stewards movement as part of rebuilding the trades union movement. I hope UNISON Branches send delegates to this conference I would certainly encourage they did so. Today’s Guardian has an interesting piece on trade union responses to globalisation, based largely on how the GMB and SEIU (Service Employees International Union from the USA) have been dealing with Group 4 Securicor and showing solidarity with workers employed by the company elsewhere in the world. (http://money.guardian.co.uk/workweekly/story/0,,1842717,00.html). This is an important part of our obligation as part of a global labour movement. However, trade union international work is generally controlled very much from the top of the union and is about as distant from accountability to the rank and file as anything we do. There is a degree of cynicism about international delegations, which are seen by some activists as holidays for a favoured few. Some delegations, such as the recent delegation to Venezuela are clearly very useful in building links and gathering information (see the report on the web at; http://www.venezuelasolidarity.org.uk/ven/web/articles/tu_delegation_dec_2005.html). Another example of a useful project is the delegation from UNISON’s Greater London Region which recently visited the Dhaka Water Union and the National Electricity Union in Bangladesh, as was the recent visit to London by South African comrades from NEHAWU. However, in other cases, delegations made up through the complex mixture of patronage and “buggin’s turn” which is widely favoured in our movement seem to be of more limited value. From a practical point of view, trade unions don’t have the resources to send loads of people travelling round the world – and now that we have the internet to organise with, we don’t need to in order to coordinate our activities. We need to explore more concrete organisational relationships if we are going to deal effectively with global employers. UNISON’s twinning relationship with Ver.Di – the largest German union, may offer a glimpse of the way forward, given our common interests (e.g. http://www.unison.org.uk/acrobat/B1846.pdf). The SEIU are also obviously thinking ahead in this area (http://www.seiu.org/about/global%5Fpartnerships/). But what should we be doing? 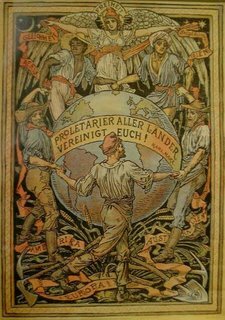 Are we heading for “international” unions, or for some other form of coordination? How different are the challenges facing predominantly private sector and predominantly public sector trade unions? Can we extend “twinning” to the level of branches and shop stewards – and should we? UNISON's TUC delegation meeting today endorsed the action of our General Secretary in sending a letter to MPs reiterating our call for our Government to demand a ceasfire in the war in Lebanon. In a letter to Labour MPs today, general secretary Dave Prentis voiced the union’s feelings about the “humanitarian catastrophe” and urged them to put pressure on Tony Blair “to make an unequivocal call for an immediate ceasefire” between Israel and Hezbollah. Israeli Prime Minister Ehud Olmert has said that there will be no ceasefire in Lebanon until an international force is deployed in the south of the country. About 750 people - mainly civilians - have been killed so far by Israeli action in Lebanon, according to Lebanon's health minister. A total of 54 Israelis, including at least 19 civilians, are known to have been killed by Hezbollah. Those who can get to London on Saturday can join the national demonstration. Saturday 5 August: Assemble 12 NoonSpeakers Corner, Hyde Park, LondonMarch to Parliament Square for rally - for more details and other actions go to www.stopwar.org.uk. You can sign a letter to Tony Blair online at the Stop the War Coalition website. UNISON’s TUC delegation meeting today agreed two amendments for submission to the annual meeting of the TUC in September – not including the amendment calling for an amnesty for so-called “illegal” migrant workers, which I proposed without success. The successful amendments dealt with the dispute over the Local Government Pension Scheme and the marketisation of education. The latter amendment was not in fact available in writing before – or indeed at - the meeting, but a large majority of the delegation nevertheless felt that this was a higher priority than an amnesty for migrant workers. The decisive argument against the amnesty proposal was probably that we could not be certain of winning the majority of votes at the Trade Union Congress. This view was put by General Secretary, Dave Prentis, who said that he could not guarantee that we would win our position at the TUC. It was reported that, based on discussions at the Scottish TUC, the Educational Institute of Scotland (EIS), who are the movers of the motion we would have amended, would not have supported our amendment, which would therefore have been forced to a vote. Jane Carolan, Chair of UNISON’s Policy Committee, said that we did not need to confront our friends on this issue at a time when TUC policy was “inching forwards”. In the event, the delegation meeting of 63 voting delegates voted to put in amendments on the LGPS (56 votes) and the marketisation of education (48 votes) and not the amnesty for migrant workers (10 votes). Whilst I appreciate the importance of the two issues upon which we have put amendments, I am disappointed that UNISON – for the second year in a row – has failed to put our own policy on migrant workers before the TUC. I think that we should be more confident that a policy supported by UNISON and the TGWU could win at Congress. This is not like the debates about the Euro. There are no unions who are militantly opposed to our position, as there were over Europe. There may be unions who are less enthusiastic about the issue – but we have the largest and third largest affiliates in support of an amnesty for so-called “illegal” migrants (and the second largest affiliate is looking to merge with the third largest…) Add in the votes of the leftwing unions whose delegations could be expected to come down on the right (left) side of the argument and we could have TUC policy in line with the views of UNISON and the TGWU. This could help to build pressure on the Government to adopt a sensible and progressive approach, rather than pandering to the reactionary politics of the tabloid press. LGPS - do we need a fifth option? I’m sorry that this is such a long post – I don’t think that is good blogging practice, but this is an important issue for more than a million of us in the Local Government Pension Scheme (LGPS). UNISON activists will be aware that our application for judicial review of the detrimental changes to the LGPS (which remove the right currently enjoyed by most scheme members to retire at 60 with an unreduced pension if we have 25 years service) will be heard in mid September. For those who have noticed that the pensions fight has sunk from the front page of the UNISON website, it is reassuring to know that Regional pension briefings are taking place – but perhaps less reassuring to hear about the content of the briefings? 11 - 12 Overview of the options for consultation This presentation will give you a clear overview of the negotiations and the options presented for informal consultation. We will then give you the opportunity to ask questions about the options. 12 - 12.45 The Trade Union Side Agenda During this activity we will discuss the key elements of the trade union agenda and outline arguments to back up our position. 1.30 - 2.15 Option B - Getting to know the option further Option B is the closest to UNISON's view on the way forward. However, there are parts of Option B that we will seek improvements on. We will develop some ideas about how to describe this option to members, outline our view on improvements and answer their questions about its potential impact. 2.13 - 3 The Next Stage of the Campaign In this final session we will consider the next steps of the campaign. We will specifically focus on engaging members and potential members, identifying areas to organise and campaigning locally to keep the pressure up. Firstly, four hours (which includes a 45 minute lunchbreak) isn't nearly long enough. Glyn Jenkin's overview (first item) took over an hour and a half, including questions, so the second item was reduced to under half an hour. There was no time for debate, just hurried questions answered even more hurriedly. I said to the organiser, National Education Officer, Louise Chinnery, that the day needed to be longer to allow for proper discussion and debate, but she said it wasn't possible and Glyn would just have to stick to his hour in future. Glyn's presentation was just the right length and cutting his time will only further reduce the opportunity for questions and discussion. I strongly recommend that you push in other regions for the briefing day to run from 11 to 4 at least. Note there is nothing about keeping the 85 year rule, or keeping contributions for the majority at 6%! Glyn said the timescale is now too tight for us to look at any options other than the 4 the DCLG have given us for consideration. So we are accepting the government and employers' timescale and can only pick from their options!!! The third aim suggests there is already a trade union side view. Who decided what that view is? What is the point of a consultation if the trade union side has already made its mind up? And now they want us to accept it and try to sell it to our members. Once again on the surface this looks good and the employers estimate that this would cost them 1.1% on the pension bill. So where is this additional money coming from….You guessed it out of the pockets of our members. The scrapping of the 85-year rule (with protection only for those over 50 years old) will save the employers at least 2.2% on the pension bill. If the government and employers agree to give half of those savings back into the scheme as promised you get an additional 1.1% put back into the scheme to pay for improved benefits. So the money for this improvement comes out of the pockets of those members under 50 years old. Brilliant! They make out that they are giving us something, but in reality we’re paying for it ourselves. Look out for Prescott and Co. appearing on rogue traders next week!" They are also proposing increasing contributions, to between 6.6% and 8.1% as well as detrimental changes to ill-health. Early retirement due to redundancy is being "dealt with" separately! Our group asked "Are any of these 4 options worth working 5 years longer?" but Glyn ducked the question by saying that it depends what sort of pension scheme you want. I strongly suspect the real answer is "NO!" I am convinced by Emma’s argument that whilst it may be that Option B really can be turned into a good deal for our members through negotiated improvements, we need to have a proper open debate around the issues, rather than being steamrollered into accepting a weak compromise. The full consultation paper is here: http://www.communities.gov.uk/index.asp?id=1501206 – activists need to look at this in order to determine how we should develop an argument around a fifth option, better than those on offer from the Government, and how we prepare our members for further action, which will be needed if we are to achieve the objectives we came out on strike for in March.